Finally a long weekend of the good variety! We were really due for some relaxing, fun time together this Memorial Day weekend. We spent Saturday over at the Higginbothams' because Ann and Kate were in town! Tess, of course, was shy at first, but Kate set to work trying to "warm her up." Presents are a great way to start! Kate had made Tess a dainty, beaded bracelet just Tess' size. Tess thought that was pretty swell! 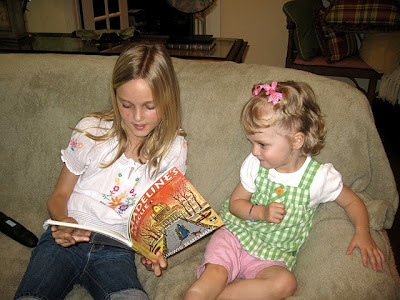 Then Kate spent the rest of the afternoon playing dollhouse with Tess, reading her stories, watching cartoons and playing with more toys. Let's just say that she won Tess over. 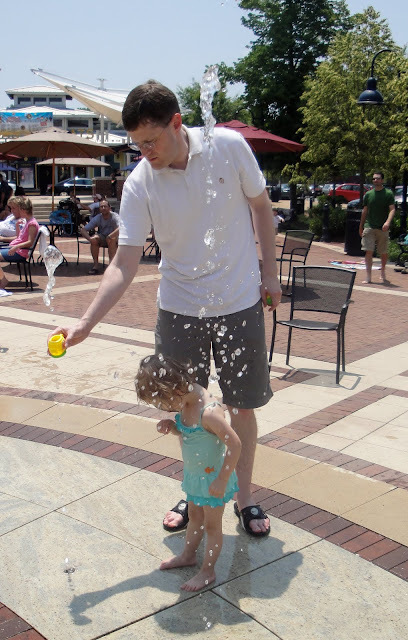 On Monday, we headed over to Fairfax Corner where the have a spraying water fountain for kids to play in. All the kids loved it! All the kids, except for Tess, of course. She got near one little spray and she suddenly thought of a thousand other things she'd rather be doing. "No sprinkles, Mommy. I take a nap." "No sprinkles, Mommy. I OK. I read a newspaper." Bit by bit, Ry was able to patiently coerce her back to the water. Tess has an exceedingly patient father. Who doesn't mind catching sprinkles in a teapot. And doesn't mind getting wetter than Tess. She didn't love it, but she did it. Good job, Tess. Afterwards, we went out for crab cakes. Tonight at dinner, Ryan taught Tess how to twirl spaghetti on her fork. Ryan also taught her how to tell the "mean boys" at the gym: "Stop! It's MY turn." Tess claims she used the phrase and accompanying "talk-to-the-hand" gesture when the "mean boys" tried taking her rocking horse at the gym today. I love it when out of the blue, Tess tells me, "I happy, Mommy." I also love it how when she gets laughing really hard, she says, "I laughing, Mom!" When I just came out of the bathroom, Tess said, "Good job, Mommy! You did it! In your own potty!" Tess has been putting random objects in a small box and surprising me with, "I present you Mommy's Day!" Who says every day isn't Mother's Day? Tess just found Ryan's stash of gummi bears. With a full mouth, she managed a garbled, "I like bears!" Today Tess came up to me, put her finger to her lips and said, "Shhhhhhhhh--baby growing." While giving Tess a bath I used a squirt toy (a fish) to get her hair wet. She looked back to see what I was doing. I told her that I was using a fish to wash her hair. She replied, "Thanks, fish!" It's a drizzly day outside, so Tess and I were talking about how the flowers, trees and birds love the rain. I asked her, "Can you think of anything else that likes the rain?" She responded, "Umbrellas." Tess has adopted a biblical tone with her newest favorite phrase: "Come, follow me!" Lately whenever I'm getting ready, Tess comes in the bathroom and tells me she has "hiccups." I was beginning to wonder about her chronic condition, until I realized she meant that she wanted to play with my "makeup," and had confused the two words. How about "Hiccup" as a name for a new makeup line? OK, maybe not so good for mascara. Tess points to our laptop several times a day and says, "Uncle Ryan 'puter. Uncle Ryan nice boy." We're banking a lot on this box. Sheer Goofiness--Tess is a very silly girl and we like to tease and goof around a lot. But I have hard time communicating to her when I'm being serious. Sometimes she'll laugh, squirm or run away because she thinks it's all part of the game. Outright Hostility--Tess has been going through a nasty little phase of this lately. When she furrows her eyebrows, she can give the look of death. The eyebrow look is often accompanied by phrases such as, "No, mama, stop! Go away!," "No, mama, turn head!," and "No, mama, I go to sleep!" Selective Hearing--This one terrifies me because it bodes of the teenage years to come. There are times when Tess will totally tune me out because she doesn't want to listen to what I'm saying. So how do you teach a 2 1/2 year old how to listen? Beats me. Me, listen? I dare you! We tried time-outs, but she just doesn't get it. She doesn't understand what the punishment is for. Or that it's punishment. Sometimes she'll even ask for time-out. Not particularly effective when you threaten "Tess, do you want a time-out?," and she responds, "Yes!" Instead, we're trying the "Listening Box." It's a box with ears (which she thinks is quite silly). When she's a good listener, she gets to add listening puffs to her box. When her box is full we get to visit the pet store (one of her favorite outings). So, is it working? Ummm...sometimes. She likes carrying the box around and adding the puffballs. I'm not sure she entirely "gets" this program either. She does ask to go to the pet store a lot. The Listening Box is not enough to bring her out of a really bad tantrum, but she definitely responds better to positive reinforcement than my attempts at punishment. At this point, that may be the best we're going to get. Tess helping me clean the table. Those puff balls are piling up! Well, I just got out of my obgyn appointment, and the doctor says everything with the baby looks just fine. He could hear the baby's heart beat loud and strong (I hate those agonizing moments when the doctor is searching around trying to find the heart beat). The baby was very active, which is a great sign. He did a physical exam and said the cervix is closed and everything is normal. The doctor said 1 in 4 women have normal bleeding in pregnancy, and I guess I'm one of the lucky 25%. He said it's more common in women who are active, and I did exercise Friday morning. It could also be that the cyst I had ruptured, though it was too small for them to see on my last ultrasound. I'm hoping it was the latter explanation. He said the bleeding could continue, and I'm not to worry about it unless I have pain or cramping. He also said I'm still good to exercise, so no excuses there. When I picked Tess up from my appointment I told her the doctor said the baby was growing healthy. She took my face in her hands and said, "How feeling, Mama?" This is one weekend I will be happy when it's over. In addition to writing my Sacrament Meeting talk for Sunday and spending WAY too much time how to print it out (since I've yet to figure out how to set up our wireless printer with this laptop), I started bleeding again Friday night. Why do possible medical emergencies ALWAYS happen on Friday night, when everything is closed and there's the longest possible wait before doctors open again on Monday morning? So yeah, bleeding again. And considerably heavier than I've had in the past. So, I call the after-hours, on-call doctor with my clinic, and he says that bleeding at this point in pregnancy is not uncommon, and that it doesn't necessarily indicate a problem with the pregnancy. He said going to the ER would be a waste of time, because they can only offer a diagnosis of what's going on, but there isn't anything they can do to treat the situation. Basically, if I'm having a miscarriage, there isn't anything they can do to stop it. His advice was to take it easy this weekend, cancel my rockclimbing plans (that was supposed to be a joke), and come into the office early Monday morning for a sonogram. He didn't mention whether or not I should be giving a talk in church on Sunday. Ry gave me a blessing today and the bleeding has slowed, but hasn't completely stopped. I never had anything like this with Tess, and I'd really like to know what's going on. But I won't find that out until Monday. So, in the mean time, you'll become my favorite reader if you can guess what song Tess is singing in this clip. Strawberry picking at Hartland Farm and Orchard! We planned to meet up with some friends for a fun-filled morning of berry hunting. YUM--fresh strawberries! Perfect for VTing gifts, general snacking, and making strawberry jam with Wendy! Tess had a fever-less day yesterday and she was ready to get out of the house. It's gorgeous today--perfect for a drive to the Virginia countryside! It's about an hour drive to the berries, so I prepped accordingly for the journey. Tess' favorite songs in the car, extra diapers, snacks, drinks, treats. Tess was very excited for our "trip." The whole way there, we talked about how yummy strawberries are when you pick them from a plant. (Tess' commentary: "UMMMMM, Braberries taste GOOOD!") And how much better they taste than those from a store. (Tess' commentary: "Blech, Braberries!") Tess also loved the idea of making strawberries into jam with Nana. "I stir it. I cook it. A stove. On toast. On top. Yum!" We finally arrived after a long, but enjoyable journey. Tess was excited to take her little basket and find a strawberry. She found one! Then she was done. And had a major meltdown. You see, I made a fatal error when trying to describe the outing to Tess. I told her we were going to pick strawberries at an orchard. "Yes, they have apple trees. But we are going to pick strawberries. It's kind of like a strawberry farm." Don't you see my HUGE mistake? Farm. FARM to Tess = cows, pigs, goats, horses and a farmer. All the way there she kept talking about the animals at the farm and how she was going to pet them ("with a fingers") and feed them. Their website did have a pictures of a few animals, so I thought there could possibly be an animal or two there. But I told her the whole way there, "I don't know if they have animals or not. If they have some, you can pet them, but I don't know if they have animals." As if that disclaimer meant anything to Tess. So, she picks one strawberry and wants to see the animals. No animals in my range of vision, but I told her would see if they had animals after we finished picking strawberries. Kaboom. Major meltdown of the century. A friend offers to take the girls off to play, but nothing will appease Tess. I hand my 10 strawberries to a friend and we head back to the car for the hour trip home. Half-way home, Tess starts screaming, "My BRABERRIES!!! My BRABERRIES!!!" We may be heading to Safeway this afternoon for some "blech berries." Sorry for the recent picture shortage. We're wrapping day 4 of high fevers and croupy cough. We had Nana & Papa over on Saturday for a belated Mother's Day celebration, which was interrupted by Tess demanding a nap and waking up with a fever. Let's just say that Tess was less than a charming hostess. I thought she was doing better this afternoon--her fever was done to 99 with no medicine. I just took it again and it's back up to 103.6. Sigh. George has been our loyal and constant companion during our quarantine. And by constant, I do mean constant. I'm wondering now if it's possible to burn a hole through a DVD from overuse. As grateful as I am that he keeps Tessie happy, I'm about ready to go crazy if I hear another, "Oo-oo-ah-ah!" We may have monkey shish kebabs for dinner tonight. It's 7:15 pm. We had a big storm (with hail!) and Tess has been worried about Dad. For the past hour, I've been answering the same question. "Where Dad going? ""Where Dad going? ""Where Dad going? ""Where Dad going? ""Where Dad going?" "I can't see Daddy. Daddy? DADA? DADDY? DADA? DADDY? DAAAAA-DAAAAA?" "Where Daddy going?" "Where Daddy going?" Tess just drew a picture of two happy faces. "It's Daddy. It's Tess." Go look out the window, Tess. "Hi Daddy! How are you Daddy? Hi Daddy! I see you Daddy! I come to door. Hi Daddy! I see him! My daddy! My daddy OK."
I just got a call from my obgyn saying that I tested positive for strep at my appointment a week ago. No wonder I've felt so lousy this past week. I thought it was just a cold. I want to climb into bed to make up for my missed recovery time. Someone bring chicken soup, please. Well, I talked to my helpful sister, who informed me, "No idiot, you have Group B Strep, not strep throat." Ahem. I stand corrected. Times like this, I'm really glad my blog is private. Yes, the doctor has sent in antibiotics to the pharmacy. Woke up to a leaking hot water heater. Ahh....the bliss. Valve on hot water heater broke when plumber was removing it. Water all over the kitchen floor. Luckily he was able to plug it and get it outside before all 50 gallons emptied themselves on my first floor. OK, so the new water heater is installed. Water is cleaned up, but everything's a mess. What else was I supposed to do today? Tonight when we went out to eat, we had to remind Tess several times during the meal to use her quiet voice in the restaurant. On the way home, Ryan asked Tess if she had a good dinner. She responded, "Yes. I too loud." Tess never likes to be left out. I must hear the phrase "I come too?" a hundred times a day. Today when we were getting ready to go to the store, Tess said, "Baby in mommy's tummy come too?" Today when I put sunscreen on Tess' cheeks and nose, she smiled at me and said, "I clown." Tess gets so excited about all the "popcorn trees" in bloom. When we drive by a stretch of blossoms, she opens her mouth and says, "I taste it, I taste it! Yum! No eat seeds." Popcorn is one of her favorite treats, and she knows not to eat the unpopped seeds. I checked to make sure she knows it's all for fun. "Tess, is the popcorn on the trees real or pretend?" "Tend, Mom. Da flowers." A very exciting package arrived in the mail yesterday from TBBITWW (The Best Brother in the Whole World): our new computer! We've gotten pretty good at living computer-less, but it's SO NICE to be connected again. We initiated our computer with a Pingu marathon and a game of Catan. We planted some spring flowers and Tess has decided that flowers are OK as long as they are growing in the ground and not dying in a vase. After she waters them with her tiny teapot, she says, "Flowers happy. Flowers a-growing!" You'll remember that mom & I made a valiant effort of bribing Tess with jellybeans to smile for her Easter pictures this year. She gets nervous in studio shots, so this is the bravest smile she could muster. She really tried, but I can tell she's terrified in this shot. 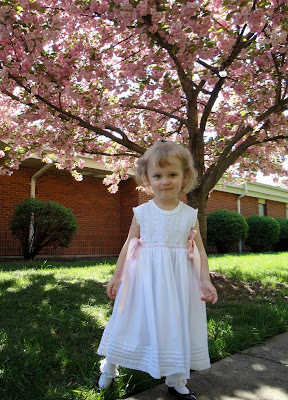 Here are few more candid shots from when she wore her dress to church. 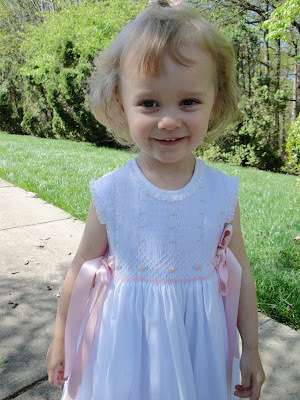 It's an amazingly beautiful dress that Wendy's sister, Debbie gave Tess when she was a newborn. It's been hanging in her room, awaiting the day when she was finally big enough to wear it. The day came sooner that I thought (it's a size 3T! ), and I can tell Tess feels special when she wears it. A couple weekends ago we ventured down to the Children's Museum in Richmond. Ryan found this great little place, Millie's Diner, which is a local favorite for brunch. The place was majorly packed, and the food was yumm-o. I recommend the Virginia omelette with lump crab and Smithfield ham. Mmmmm. I'm hungry. The Children's Museum was also a big hit. For interested locals, we found out that the first full weekend of the month, Bank of America cardholders get in free! We only had to pay for Tess (I guess we should open an account for her!) We expected it to be crowded on the weekend, but it really wasn't too bad. The museum is huge and there is activity after activity perfectly suited for young children. Tess was in a frenzy jumping from each exhibit. 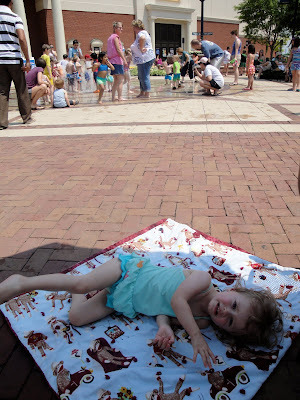 We stayed too long, which led to a major meltdown in the end, but she had a really good time. We definitely have to go back again soon. Tess has been enjoying lots of playdates with friends and she always makes friends when we go to the park. Tess met this little girl named Lauren at the park, and they instantly became fast friends. I had my first visit with a normal, non-infertility specialist doctor! It's so weird to visit an office filled with baby stuff, pregnancy magazines and pregnant women. Anyway, I think the doctor's going to be great and I'm hoping for a better experience than I had last time with Kaiser. I was concerned because the morning of my appointment, I'd had some light spotting, which I'd never had before when I was pregnant. The doctor did an exam and said everything looked good, with no bleeding. The baby was so cute on the ultrasound. I could see it kicking it's little legs and arms around. The baby's 3.8 cm at this point--about the length from your thumb knuckle to the tip of your thumb. In this pic, the baby is looking face down. The far right + is at the top of it's head and the left + is between it's arm and leg. Make sense? I've been really tired with this baby, and over the past couple weeks nausea has set in. It hits me pretty regularly around 11 am and 5 pm, and it doesn't seem to be tied to whether I've eaten or not. The nausea typically comes with an intense food craving which differs every time, and doesn't go away until I've eaten that particular item. I've also started having super-crazy dreams every single night. They're not baby related, but usually involve some impossible task I'm supposed to complete and my maze-like journey to complete this task. OK, when you put it that way, it does kind of sound like trying to have a baby. About another 1 1/2 weeks until I'm done with the first trimester, and I'm hoping some of these side effects dissipate. I know you are all concerned that maybe, for some inexplicable reason, Tess may have ceased being cute. Rest assured, Tess continues to be cute and says things every day that surprise us and make us laugh out loud. 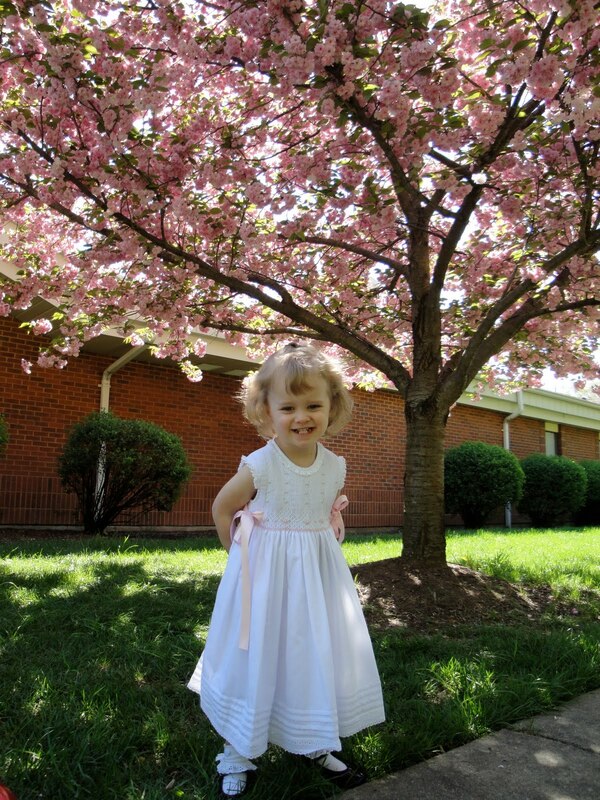 Tess loves seeing the picture of herself in her Easter dress. When she comes in the room, she often runs over to it and says, "That's me!" She likes pointing out pictures of others, too. If her book has a picture of a cat, she'll run and get her stuffed kitty, point and say, "That's you!" Mom: "Tess, it's time for a nap. Tess: "No, nap. Not today." Mom: "No nap today? How about a nap tomorrow?" Tess: "No nap, not ever, ever, ever!" I hear the "not ever, ever, ever" line a lot these days. I was reading an article on Ry's Blackberry, and Tess pointed to a question mark and said, "Question." I was stunned. How in the world would she know that? Thinking that maybe I misheard understood her, I asked, "A crescent?" (Crescents are one of her favorite shapes.) "No, Mom." "A question?" "Yeah, Mom." My best guess is that she picked it up from watching Super Why. Another likely fallout from watching Super Why, Tess now likes to play "Super Tess." This games consists of Tess holding a blanket behind her shoulders, running around yelling, "Super TESSSSS! Super TESSSSS!" Lately, whenever Tess gets hurt, gets in trouble or gets embarrassed, she "plays dead" and pretends to be asleep. She'll drop to the floor or close her eyes and start making fake snoring sounds. This little trick is getting less and less cute. It's an effective coping mechanism, because she never has to face an awkward situation, but it's not a particularly healthy one. I really don't know how to handle this one. I tell her to wake up, that she's not asleep, and that she needs to face the proverbial music. Any suggestions on this one? Tess has two personas that she's learned to command from me on demand. One is Charlie, who's a friendly chap consisting of my two fingers. He's good company and has been around for a while. Her newest imaginary friend is "Kitty." Whenever she looks at me and asks, "Kitty?," I'm expected to go into full-Kitty mode. "Meow, meow, Tess." "Play toys, Kitty?" "Meow, meow, yes, Tess! Play toys, meow, meow." One good thing about Charlie and Kitty is that Tess will do anything I ask, provided Charlie or Kitty does the asking. The other day, Tess asked me to sing the "bushpeck" song. It took me forever to figure out she was saying "bushpeck," and once I deciphered that, I still had no idea what it meant. I finally realized that she was referring to one of her favorite songs, "I Love You a Bushel and a Peck," (Doris Day, from Guys and Dolls). Whenever I sing that song to her, she says, "More, more?" C'est ca for now! We missed you all and we're glad to be back!